Walden Pond Press, 9780062071644, 240pp. 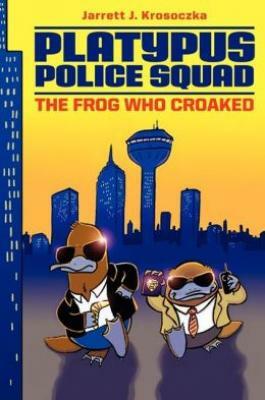 Platypus Police Squad: The Frog Who Croaked is the first in a series of zany, action-packed middle grade mysteries featuring platypus police detectives Rick Zengo and Corey O’Malley. When a call comes in about a crime down at the docks involving a missing schoolteacher and a duffle bag full of illegal fish, Zengo and O’Malley are going to have to learn to set their differences aside if they want to get to the bottom of this. Especially when the clues all point to Frank Pandini Jr., Kallamazoo’s first son and its most powerful, well-respected businessman. Fans of Adam Rex, Jon Scieszka, and Jarrett J. Krosoczka’s own Lunch Lady graphic novels will flip for Jarrett’s series of funny illustrated Platypus Police Squad middle grade novels! Jarrett J. Krosoczka is the author and/or illustrator of over thirty books for young readers. He can be heard weekly on SiriusXM's Kids Place Live and his TED Talks have accumulated nearly two million views online. His graphic novel memoir for teens, Hey, Kiddo, is a National Book Award nominee. Learn more at StudioJJK.com or follow @StudioJJK.